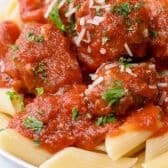 Tender juicy meatballs in an easy tomato sauce requires very little prep and has amazing flavor! Spray slow cooker with cooking spray. Combine all meatball ingredients in a a bowl. Using a tablespoon, form 24 meatballs. Place uncooked meatballs in the bottom of the slow cooker. Combine all sauce ingredients in a large bowl. Pour over meatballs and cook on high for 3-4 hours.